Is Audi's CEO's arrest over Dieselgate an end of Deutscland AG? In Germany, there used to be a thing called ‘Deutschland AG.’ It meant a close connection between carmakers, the government, and labour unions. And it was epitomized by Volkswagen – partially owned by the state of Lower Saxony and with a traditionally strong worker’s council. That era has come to an abrupt end with the diesel scandal, which originated in the US – but the German government and prosecutors have latched on to it. As of the 18th of June, it has culminated into the jailing of Rupert Stadler – Audi’s CEO for 11 years. He has led the company to incredible heights during his tenure. And now he has fallen over a phone call. Having listened in on his phone conversations, Munich prosecutors have concluded that Stadler tried to “obfuscate” their investigation of the supposed cheat devices by apparently considering the sacking of an employee that had laid the blame on him. Jailing an acting CEO of a company of Audi’s size and importance is a shocking move, but there was a precedent of sorts in the jailing of Wolfgang Hatz, former Porsche R&D chief and Volkswagen Group board member for powertrains. Hatz has been held in custody without trial for over eight months now. But he had already stepped down, and this had kept the interruption of the Volkswagen Group within boundaries. Stadler, by the way, is no engineer. I suspect he delegated the diesel topic to his R&D department, asking them to solve the problem. He would hardly have gotten into the technical details of injection systems and catalysers. Being held in custody in Germany is not a laughing matter. Visitors and access to information are severely limited, and conditions are far from comfortable. The fact that the prosecution was allowed to reach this level speaks volumes about the nature of the discourse in Germany. Mistrust in the auto industry in political and media circles has reached unprecedented heights. The outrage seems fake. For many years, modern engines were tuned to comply with the regulations within certain testing windows. It was a fine line to walk, but the process was, by and large, known to the regulatory outfits. The technology to make engines comply with emissions regulation across the entire range of user scenarios was simply not available. Meanwhile, Audi has scrambled to fill the huge void at the top. The company’s interim CEO, Abraham Schot, is a rookie to the company – he joined the Volkswagen Group in 2011, and only joined Audi as sales and marketing chief in late 2017. He is untarnished by the diesel scandal, and perhaps that’s why he was chosen to take over Stadler’ role temporarily. Surprisingly, one group has been largely unfazed by the diesel scandal – the customers. Yes, there is anger. Some politicians have been ambiguous about allowing owners to keep using their diesels. But the Germans keep buying. The take rate of diesels in Audi’s German fleet has dropped from nearly 50% to near 40%, and has stabilised there. Other markets have not seen a dip in the diesel take rate at all. Still, there is reason to be worried. The mood within the Volkswagen Group is at an all-time low. And German carmakers are considering moving their R&D elsewhere. Daimler has just announced massive investments in China. What’s more, who will join a business where he or she can be hauled off to jail at any time? Germany’s traffic minister has just threatened Daimler CEO, Dieter Zetsche, with penalties in in the billions. Like never before, Germany’s lead industry is under attack from politicians, prosecutors and parts of the media. At least Rupert Stadler was allowed to save face. 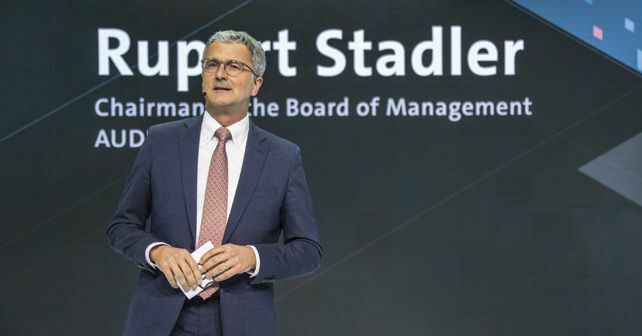 The Volkswagen and Audi supervisory boards have stated that Stadler himself formally requested to be released from his position. And their statement includes noting that his leave is temporary. But the labour union, and the head of the state of Lower Saxony argued against this gesture of generosity. ‘Deutschland AG,’ it seems, is well and truly dead.